The Confederation Inkstand is a Canadian artifact that, although unremarkable in its design and manufacture, is historically important because it was used at three significant moments in the nation’s history. the admittance of Newfoundland into Confederation in December 1948 and February 1949. The inkstand, made of ebonized (black painted) wood, and was likely manufactured between 1861 and 1864. The date was estimated by an expert appraiser based on the popularity of ebonized furnishings. Ebonized wood became fashionable following the death of Prince Albert, husband of Queen Victoria, who arranged for much of her furniture to be painted black as a sign of mourning. It holds two identical cut glass inkwells with brass collars sitting within circular recesses. There are two elongated recesses for quills and a curved handle centered lengthwise along the top, and the front has a single drawer. Encrier dont se sont servi les Promoteurs de la Confédération Canadienne pour signer les résolutions adoptées à la Conférence de Québec. Sir E‐P Taché / Mademoiselle C.A. Taché. In the photo, the inkstand can be seen on the table in front of the delegates, and is identified by its profile, the double wells and its handle. It is questionable that this inkstand was used at the Charlottetown Conference of September the same year: given the comprehensive manner in which the inkstand’s uses are noted on the plaques, and the fact that it came from a delegate’s family, its known use at Charlottetown would not likely have been omitted from these commemorations. The inkstand was used a second time in August 1943 at the first of two war-time conferences (codenamed “QUADRANT”), a highly secret strategic meeting held in Quebec City to determine the future course of the Second World War. 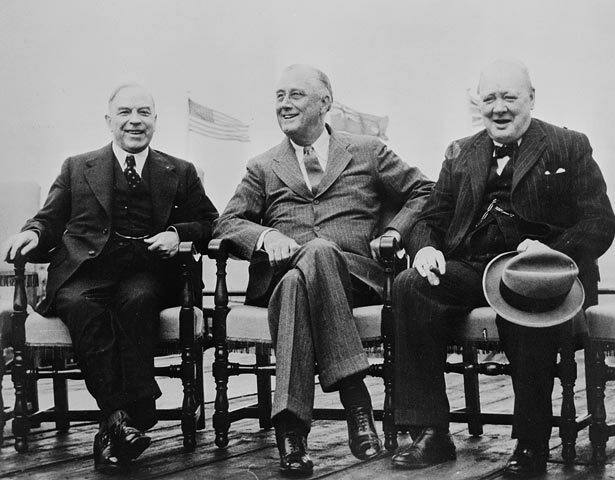 It was attended by British Prime Minister Winston Churchill and US President Franklin D. Roosevelt, and hosted by Canada’s Prime Minister, William Lyon Mackenzie King. On December 11, 1948, this Inkstand was used by the delegates of Canada and Newfoundland at the signing in Ottawa of the Terms of Union. The inkstand can be seen clearly on the table in front of the delegation. Seated are Louis St-Laurent, Prime Minister of Canada, and A.J. Walsh, chairman of the Newfoundland delegation. Joey Smallwood, first premier of the new province, is standing second from right. On 11 December, 1948, the Terms of Union were signed in the Senate Chamber at Ottawa with a subsequent signing in the Commons on 7 February, 1949. To the Canadian Nation from Major R.A.C. Kane, VD, grandson of Sir Etienne P. Taché. 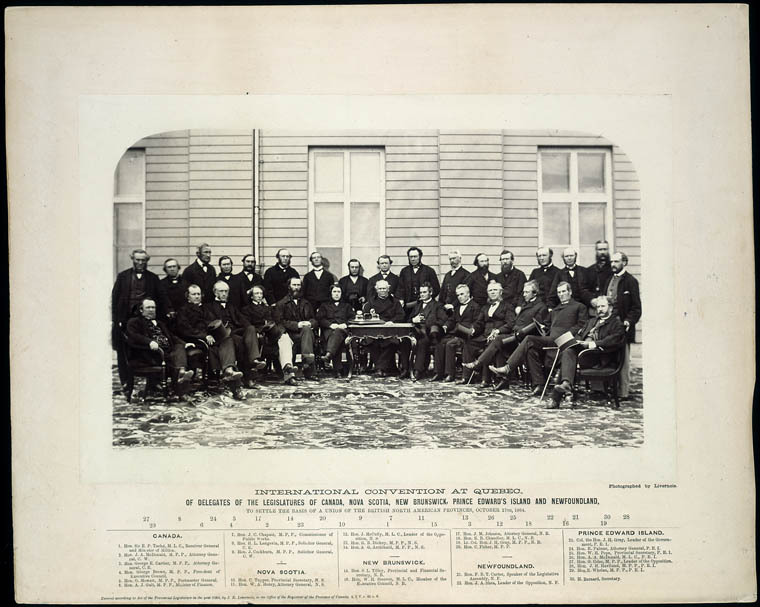 It is reasonable to accept that indeed the inkstand would have been presented to Taché in recognition of his important role at the conference. This establishes a connection to the event. The second element to confirm its provenance and indeed its authenticity is the connection of the donor to Taché: Major R.A.C. Kane was indeed a direct descendant of Taché, with genealogical research suggesting that he was in fact Taché’s great-grandson. The Confederation Inkstand is normally housed in the Todd-Faribault Room of the Main Library. However, for the remainder of this year, the inkstand is on loan to The Canadian Museum of History for inclusion in their exhibit, 1867: Rebellion and Confederation. Further details on the exhibit are available at the museum’s website.